Before sunset on the memorable day on which King Charles the First was executed, the House of Commons passed an act declaring it treason in any one to proclaim the Prince of Wales--or anybody else--King of England. Soon afterwards, it declared that the House of Lords was useless and dangerous, and ought to be abolished; and directed that the late King's statue should be taken down from the Royal Exchange in the City and other public places. Having laid hold of some famous Royalists who had escaped from prison, and having beheaded the DUKE OF HAMILTON, LORD HOLLAND, and LORD CAPEL, in Palace Yard (all of whom died very courageously), they then appointed a Council of State to govern the country. It consisted of forty-one members, of whom five were peers. Bradshaw was made president. The House of Commons also re-admitted members who had opposed the King's death, and made up its numbers to about a hundred and fifty. But, it still had an army of more than forty thousand men to deal with, and a very hard task it was to manage them. Before the King's execution, the army had appointed some of its officers to remonstrate between them and the Parliament; and now the common soldiers began to take that office upon themselves. The regiments under orders for Ireland mutinied; one troop of horse in the city of London seized their own flag, and refused to obey orders. For this, the ringleader was shot: which did not mend the matter, for, both his comrades and the people made a public funeral for him, and accompanied the body to the grave with sound of trumpets and with a gloomy procession of persons carrying bundles of rosemary steeped in blood. Oliver was the only man to deal with such difficulties as these, and he soon cut them short by bursting at midnight into the town of Burford, near Salisbury, where the mutineers were sheltered, taking four hundred of them prisoners, and shooting a number of them by sentence of court-martial. The soldiers soon found, as all men did, that Oliver was not a man to be trifled with. And there was an end of the mutiny. The Scottish Parliament did not know Oliver yet; so, on hearing of the King's execution, it proclaimed the Prince of Wales King Charles the Second, on condition of his respecting the Solemn League and Covenant. Charles was abroad at that time, and so was Montrose, from whose help he had hopes enough to keep him holding on and off with commissioners from Scotland, just as his father might have done. These hopes were soon at an end; for, Montrose, having raised a few hundred exiles in Germany, and landed with them in Scotland, found that the people there, instead of joining him, deserted the country at his approach. He was soon taken prisoner and carried to Edinburgh. There he was received with every possible insult, and carried to prison in a cart, his officers going two and two before him. He was sentenced by the Parliament to be hanged on a gallows thirty feet high, to have his head set on a spike in Edinburgh, and his limbs distributed in other places, according to the old barbarous manner. He said he had always acted under the Royal orders, and only wished he had limbs enough to be distributed through Christendom, that it might be the more widely known how loyal he had been. He went to the scaffold in a bright and brilliant dress, and made a bold end at thirty- eight years of age. The breath was scarcely out of his body when Charles abandoned his memory, and denied that he had ever given him orders to rise in his behalf. O the family failing was strong in that Charles then! Oliver had been appointed by the Parliament to command the army in Ireland, where he took a terrible vengeance for the sanguinary rebellion, and made tremendous havoc, particularly in the siege of Drogheda, where no quarter was given, and where he found at least a thousand of the inhabitants shut up together in the great church: every one of whom was killed by his soldiers, usually known as OLIVER'S IRONSIDES. There were numbers of friars and priests among them, and Oliver gruffly wrote home in his despatch that these were 'knocked on the head' like the rest. But, Charles having got over to Scotland where the men of the Solemn League and Covenant led him a prodigiously dull life and made him very weary with long sermons and grim Sundays, the Parliament called the redoubtable Oliver home to knock the Scottish men on the head for setting up that Prince. Oliver left his son-in-law, Ireton, as general in Ireland in his stead (he died there afterwards), and he imitated the example of his father-in-law with such good will that he brought the country to subjection, and laid it at the feet of the Parliament. In the end, they passed an act for the settlement of Ireland, generally pardoning all the common people, but exempting from this grace such of the wealthier sort as had been concerned in the rebellion, or in any killing of Protestants, or who refused to lay down their arms. Great numbers of Irish were got out of the country to serve under Catholic powers abroad, and a quantity of land was declared to have been forfeited by past offences, and was given to people who had lent money to the Parliament early in the war. These were sweeping measures; but, if Oliver Cromwell had had his own way fully, and had stayed in Ireland, he would have done more yet. However, as I have said, the Parliament wanted Oliver for Scotland; so, home Oliver came, and was made Commander of all the Forces of the Commonwealth of England, and in three days away he went with sixteen thousand soldiers to fight the Scottish men. Now, the Scottish men, being then--as you will generally find them now--mighty cautious, reflected that the troops they had were not used to war like the Ironsides, and would be beaten in an open fight. Therefore they said, 'If we live quiet in our trenches in Edinburgh here, and if all the farmers come into the town and desert the country, the Ironsides will be driven out by iron hunger and be forced to go away.' This was, no doubt, the wisest plan; but as the Scottish clergy would interfere with what they knew nothing about, and would perpetually preach long sermons exhorting the soldiers to come out and fight, the soldiers got it in their heads that they absolutely must come out and fight. Accordingly, in an evil hour for themselves, they came out of their safe position. Oliver fell upon them instantly, and killed three thousand, and took ten thousand prisoners. To gratify the Scottish Parliament, and preserve their favour, Charles had signed a declaration they laid before him, reproaching the memory of his father and mother, and representing himself as a most religious Prince, to whom the Solemn League and Covenant was as dear as life. He meant no sort of truth in this, and soon afterwards galloped away on horseback to join some tiresome Highland friends, who were always flourishing dirks and broadswords. He was overtaken and induced to return; but this attempt, which was called 'The Start,' did him just so much service, that they did not preach quite such long sermons at him afterwards as they had done before. On the first of January, one thousand six hundred and fifty-one, the Scottish people crowned him at Scone. He immediately took the chief command of an army of twenty thousand men, and marched to Stirling. His hopes were heightened, I dare say, by the redoubtable Oliver being ill of an ague; but Oliver scrambled out of bed in no time, and went to work with such energy that he got behind the Royalist army and cut it off from all communication with Scotland. There was nothing for it then, but to go on to England; so it went on as far as Worcester, where the mayor and some of the gentry proclaimed King Charles the Second straightway. His proclamation, however, was of little use to him, for very few Royalists appeared; and, on the very same day, two people were publicly beheaded on Tower Hill for espousing his cause. Up came Oliver to Worcester too, at double quick speed, and he and his Ironsides so laid about them in the great battle which was fought there, that they completely beat the Scottish men, and destroyed the Royalist army; though the Scottish men fought so gallantly that it took five hours to do. The escape of Charles after this battle of Worcester did him good service long afterwards, for it induced many of the generous English people to take a romantic interest in him, and to think much better of him than he ever deserved. 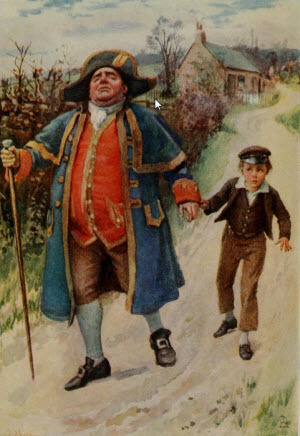 He fled in the night, with not more than sixty followers, to the house of a Catholic lady in Staffordshire. There, for his greater safety, the whole sixty left him. He cropped his hair, stained his face and hands brown as if they were sunburnt, put on the clothes of a labouring countryman, and went out in the morning with his axe in his hand, accompanied by four wood-cutters who were brothers, and another man who was their brother-in-law. These good fellows made a bed for him under a tree, as the weather was very bad; and the wife of one of them brought him food to eat; and the old mother of the four brothers came and fell down on her knees before him in the wood, and thanked God that her sons were engaged in saving his life. At night, he came out of the forest and went on to another house which was near the river Severn, with the intention of passing into Wales; but the place swarmed with soldiers, and the bridges were guarded, and all the boats were made fast. So, after lying in a hayloft covered over with hay, for some time, he came out of his place, attended by COLONEL CARELESS, a Catholic gentleman who had met him there, and with whom he lay hid, all next day, up in the shady branches of a fine old oak. It was lucky for the King that it was September-time, and that the leaves had not begun to fall, since he and the Colonel, perched up in this tree, could catch glimpses of the soldiers riding about below, and could hear the crash in the wood as they went about beating the boughs. 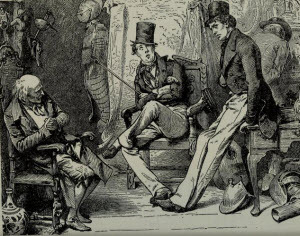 After this, he walked and walked until his feet were all blistered; and, having been concealed all one day in a house which was searched by the troopers while he was there, went with LORD WILMOT, another of his good friends, to a place called Bentley, where one MISS LANE, a Protestant lady, had obtained a pass to be allowed to ride through the guards to see a relation of hers near Bristol. Disguised as a servant, he rode in the saddle before this young lady to the house of SIR JOHN WINTER, while Lord Wilmot rode there boldly, like a plain country gentleman, with dogs at his heels. It happened that Sir John Winter's butler had been servant in Richmond Palace, and knew Charles the moment he set eyes upon him; but, the butler was faithful and kept the secret. As no ship could be found to carry him abroad, it was planned that he should go--still travelling with Miss Lane as her servant--to another house, at Trent near Sherborne in Dorsetshire; and then Miss Lane and her cousin, MR. LASCELLES, who had gone on horseback beside her all the way, went home. I hope Miss Lane was going to marry that cousin, for I am sure she must have been a brave, kind girl. If I had been that cousin, I should certainly have loved Miss Lane. From this dangerous place he returned to Trent, and lay there concealed several days. Then he escaped to Heale, near Salisbury; where, in the house of a widow lady, he was hidden five days, until the master of a collier lying off Shoreham in Sussex, undertook to convey a 'gentleman' to France. On the night of the fifteenth of October, accompanied by two colonels and a merchant, the King rode to Brighton, then a little fishing village, to give the captain of the ship a supper before going on board; but, so many people knew him, that this captain knew him too, and not only he, but the landlord and landlady also. Before he went away, the landlord came behind his chair, kissed his hand, and said he hoped to live to be a lord and to see his wife a lady; at which Charles laughed. 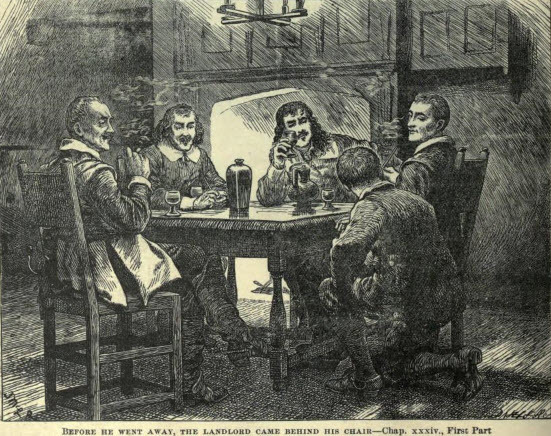 They had had a good supper by this time, and plenty of smoking and drinking, at which the King was a first-rate hand; so, the captain assured him that he would stand by him, and he did. It was agreed that the captain should pretend to sail to Deal, and that Charles should address the sailors and say he was a gentleman in debt who was running away from his creditors, and that he hoped they would join him in persuading the captain to put him ashore in France. As the King acted his part very well indeed, and gave the sailors twenty shillings to drink, they begged the captain to do what such a worthy gentleman asked. He pretended to yield to their entreaties, and the King got safe to Normandy. Ireland being now subdued, and Scotland kept quiet by plenty of forts and soldiers put there by Oliver, the Parliament would have gone on quietly enough, as far as fighting with any foreign enemy went, but for getting into trouble with the Dutch, who in the spring of the year one thousand six hundred and fifty-one sent a fleet into the Downs under their ADMIRAL VAN TROMP, to call upon the bold English ADMIRAL BLAKE (who was there with half as many ships as the Dutch) to strike his flag. Blake fired a raging broadside instead, and beat off Van Tromp; who, in the autumn, came back again with seventy ships, and challenged the bold Blake--who still was only half as strong--to fight him. Blake fought him all day; but, finding that the Dutch were too many for him, got quietly off at night. What does Van Tromp upon this, but goes cruising and boasting about the Channel, between the North Foreland and the Isle of Wight, with a great Dutch broom tied to his masthead, as a sign that he could and would sweep the English of the sea! Within three months, Blake lowered his tone though, and his broom too; for, he and two other bold commanders, DEAN and MONK, fought him three whole days, took twenty-three of his ships, shivered his broom to pieces, and settled his business. Things were no sooner quiet again, than the army began to complain to the Parliament that they were not governing the nation properly, and to hint that they thought they could do it better themselves. Oliver, who had now made up his mind to be the head of the state, or nothing at all, supported them in this, and called a meeting of officers and his own Parliamentary friends, at his lodgings in Whitehall, to consider the best way of getting rid of the Parliament. It had now lasted just as many years as the King's unbridled power had lasted, before it came into existence. 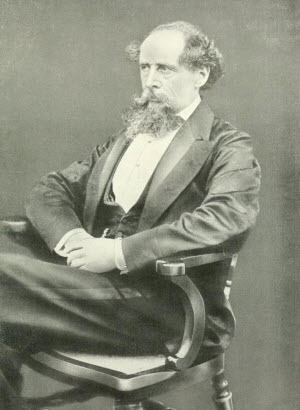 The end of the deliberation was, that Oliver went down to the House in his usual plain black dress, with his usual grey worsted stockings, but with an unusual party of soldiers behind him. These last he left in the lobby, and then went in and sat down. Presently he got up, made the Parliament a speech, told them that the Lord had done with them, stamped his foot and said, 'You are no Parliament. Bring them in! Bring them in!' At this signal the door flew open, and the soldiers appeared. 'This is not honest,' said Sir Harry Vane, one of the members. 'Sir Harry Vane!' cried Cromwell; 'O, Sir Harry Vane! The Lord deliver me from Sir Harry Vane!' Then he pointed out members one by one, and said this man was a drunkard, and that man a dissipated fellow, and that man a liar, and so on. Then he caused the Speaker to be walked out of his chair, told the guard to clear the House, called the mace upon the table--which is a sign that the House is sitting--'a fool's bauble,' and said, 'here, carry it away!' Being obeyed in all these orders, he quietly locked the door, put the key in his pocket, walked back to Whitehall again, and told his friends, who were still assembled there, what he had done. They formed a new Council of State after this extraordinary proceeding, and got a new Parliament together in their own way: which Oliver himself opened in a sort of sermon, and which he said was the beginning of a perfect heaven upon earth. In this Parliament there sat a well-known leather-seller, who had taken the singular name of Praise God Barebones, and from whom it was called, for a joke, Barebones's Parliament, though its general name was the Little Parliament. As it soon appeared that it was not going to put Oliver in the first place, it turned out to be not at all like the beginning of heaven upon earth, and Oliver said it really was not to be borne with. So he cleared off that Parliament in much the same way as he had disposed of the other; and then the council of officers decided that he must be made the supreme authority of the kingdom, under the title of the Lord Protector of the Commonwealth. So, on the sixteenth of December, one thousand six hundred and fifty-three, a great procession was formed at Oliver's door, and he came out in a black velvet suit and a big pair of boots, and got into his coach and went down to Westminster, attended by the judges, and the lord mayor, and the aldermen, and all the other great and wonderful personages of the country. There, in the Court of Chancery, he publicly accepted the office of Lord Protector. Then he was sworn, and the City sword was handed to him, and the seal was handed to him, and all the other things were handed to him which are usually handed to Kings and Queens on state occasions. When Oliver had handed them all back, he was quite made and completely finished off as Lord Protector; and several of the Ironsides preached about it at great length, all the evening. Oliver Cromwell--whom the people long called OLD NOLL--in accepting the office of Protector, had bound himself by a certain paper which was handed to him, called 'the Instrument,' to summon a Parliament, consisting of between four and five hundred members, in the election of which neither the Royalists nor the Catholics were to have any share. He had also pledged himself that this Parliament should not be dissolved without its own consent until it had sat five months. When this Parliament met, Oliver made a speech to them of three hours long, very wisely advising them what to do for the credit and happiness of the country. To keep down the more violent members, he required them to sign a recognition of what they were forbidden by 'the Instrument' to do; which was, chiefly, to take the power from one single person at the head of the state or to command the army. Then he dismissed them to go to work. With his usual vigour and resolution he went to work himself with some frantic preachers--who were rather overdoing their sermons in calling him a villain and a tyrant--by shutting up their chapels, and sending a few of them off to prison. There was not at that time, in England or anywhere else, a man so able to govern the country as Oliver Cromwell. Although he ruled with a strong hand, and levied a very heavy tax on the Royalists (but not until they had plotted against his life), he ruled wisely, and as the times required. He caused England to be so respected abroad, that I wish some lords and gentlemen who have governed it under kings and queens in later days would have taken a leaf out of Oliver Cromwell's book. He sent bold Admiral Blake to the Mediterranean Sea, to make the Duke of Tuscany pay sixty thousand pounds for injuries he had done to British subjects, and spoliation he had committed on English merchants. He further despatched him and his fleet to Algiers, Tunis, and Tripoli, to have every English ship and every English man delivered up to him that had been taken by pirates in those parts. All this was gloriously done; and it began to be thoroughly well known, all over the world, that England was governed by a man in earnest, who would not allow the English name to be insulted or slighted anywhere. These were not all his foreign triumphs. He sent a fleet to sea against the Dutch; and the two powers, each with one hundred ships upon its side, met in the English Channel off the North Foreland, where the fight lasted all day long. Dean was killed in this fight; but Monk, who commanded in the same ship with him, threw his cloak over his body, that the sailors might not know of his death, and be disheartened. Nor were they. The English broadsides so exceedingly astonished the Dutch that they sheered off at last, though the redoubtable Van Tromp fired upon them with his own guns for deserting their flag. Soon afterwards, the two fleets engaged again, off the coast of Holland. There, the valiant Van Tromp was shot through the heart, and the Dutch gave in, and peace was made. Further than this, Oliver resolved not to bear the domineering and bigoted conduct of Spain, which country not only claimed a right to all the gold and silver that could be found in South America, and treated the ships of all other countries who visited those regions, as pirates, but put English subjects into the horrible Spanish prisons of the Inquisition. So, Oliver told the Spanish ambassador that English ships must be free to go wherever they would, and that English merchants must not be thrown into those same dungeons, no, not for the pleasure of all the priests in Spain. To this, the Spanish ambassador replied that the gold and silver country, and the Holy Inquisition, were his King's two eyes, neither of which he could submit to have put out. Very well, said Oliver, then he was afraid he (Oliver) must damage those two eyes directly. So, another fleet was despatched under two commanders, PENN and VENABLES, for Hispaniola; where, however, the Spaniards got the better of the fight. Consequently, the fleet came home again, after taking Jamaica on the way. Oliver, indignant with the two commanders who had not done what bold Admiral Blake would have done, clapped them both into prison, declared war against Spain, and made a treaty with France, in virtue of which it was to shelter the King and his brother the Duke of York no longer. Then, he sent a fleet abroad under bold Admiral Blake, which brought the King of Portugal to his senses--just to keep its hand in--and then engaged a Spanish fleet, sunk four great ships, and took two more, laden with silver to the value of two millions of pounds: which dazzling prize was brought from Portsmouth to London in waggons, with the populace of all the towns and villages through which the waggons passed, shouting with all their might. After this victory, bold Admiral Blake sailed away to the port of Santa Cruz to cut off the Spanish treasure-ships coming from Mexico. There, he found them, ten in number, with seven others to take care of them, and a big castle, and seven batteries, all roaring and blazing away at him with great guns. Blake cared no more for great guns than for pop-guns--no more for their hot iron balls than for snow-balls. He dashed into the harbour, captured and burnt every one of the ships, and came sailing out again triumphantly, with the victorious English flag flying at his masthead. This was the last triumph of this great commander, who had sailed and fought until he was quite worn out. He died, as his successful ship was coming into Plymouth Harbour amidst the joyful acclamations of the people, and was buried in state in Westminster Abbey. Not to lie there, long. Over and above all this, Oliver found that the VAUDOIS, or Protestant people of the valleys of Lucerne, were insolently treated by the Catholic powers, and were even put to death for their religion, in an audacious and bloody manner. Instantly, he informed those powers that this was a thing which Protestant England would not allow; and he speedily carried his point, through the might of his great name, and established their right to worship God in peace after their own harmless manner. Lastly, his English army won such admiration in fighting with the French against the Spaniards, that, after they had assaulted the town of Dunkirk together, the French King in person gave it up to the English, that it might be a token to them of their might and valour. There were plots enough against Oliver among the frantic religionists (who called themselves Fifth Monarchy Men), and among the disappointed Republicans. He had a difficult game to play, for the Royalists were always ready to side with either party against him. The 'King over the water,' too, as Charles was called, had no scruples about plotting with any one against his life; although there is reason to suppose that he would willingly have married one of his daughters, if Oliver would have had such a son-in-law. There was a certain COLONEL SAXBY of the army, once a great supporter of Oliver's but now turned against him, who was a grievous trouble to him through all this part of his career; and who came and went between the discontented in England and Spain, and Charles who put himself in alliance with Spain on being thrown off by France. This man died in prison at last; but not until there had been very serious plots between the Royalists and Republicans, and an actual rising of them in England, when they burst into the city of Salisbury, on a Sunday night, seized the judges who were going to hold the assizes there next day, and would have hanged them but for the merciful objections of the more temperate of their number. Oliver was so vigorous and shrewd that he soon put this revolt down, as he did most other conspiracies; and it was well for one of its chief managers--that same Lord Wilmot who had assisted in Charles's flight, and was now EARL OF ROCHESTER--that he made his escape. Oliver seemed to have eyes and ears everywhere, and secured such sources of information as his enemies little dreamed of. There was a chosen body of six persons, called the Sealed Knot, who were in the closest and most secret confidence of Charles. One of the foremost of these very men, a SIR RICHARD WILLIS, reported to Oliver everything that passed among them, and had two hundred a year for it. MILES SYNDARCOMB, also of the old army, was another conspirator against the Protector. He and a man named CECIL, bribed one of his Life Guards to let them have good notice when he was going out--intending to shoot him from a window. But, owing either to his caution or his good fortune, they could never get an aim at him. Disappointed in this design, they got into the chapel in Whitehall, with a basketful of combustibles, which were to explode by means of a slow match in six hours; then, in the noise and confusion of the fire, they hoped to kill Oliver. But, the Life Guardsman himself disclosed this plot; and they were seized, and Miles died (or killed himself in prison) a little while before he was ordered for execution. A few such plotters Oliver caused to be beheaded, a few more to be hanged, and many more, including those who rose in arms against him, to be sent as slaves to the West Indies. If he were rigid, he was impartial too, in asserting the laws of England. When a Portuguese nobleman, the brother of the Portuguese ambassador, killed a London citizen in mistake for another man with whom he had had a quarrel, Oliver caused him to be tried before a jury of Englishmen and foreigners, and had him executed in spite of the entreaties of all the ambassadors in London. One of Oliver's own friends, the DUKE OF OLDENBURGH, in sending him a present of six fine coach-horses, was very near doing more to please the Royalists than all the plotters put together. One day, Oliver went with his coach, drawn by these six horses, into Hyde Park, to dine with his secretary and some of his other gentlemen under the trees there. After dinner, being merry, he took it into his head to put his friends inside and to drive them home: a postillion riding one of the foremost horses, as the custom was. On account of Oliver's being too free with the whip, the six fine horses went off at a gallop, the postillion got thrown, and Oliver fell upon the coach-pole and narrowly escaped being shot by his own pistol, which got entangled with his clothes in the harness, and went off. He was dragged some distance by the foot, until his foot came out of the shoe, and then he came safely to the ground under the broad body of the coach, and was very little the worse. The gentlemen inside were only bruised, and the discontented people of all parties were much disappointed. The rest of the history of the Protectorate of Oliver Cromwell is a history of his Parliaments. His first one not pleasing him at all, he waited until the five months were out, and then dissolved it. The next was better suited to his views; and from that he desired to get--if he could with safety to himself--the title of King. He had had this in his mind some time: whether because he thought that the English people, being more used to the title, were more likely to obey it; or whether because he really wished to be a king himself, and to leave the succession to that title in his family, is far from clear. He was already as high, in England and in all the world, as he would ever be, and I doubt if he cared for the mere name. However, a paper, called the 'Humble Petition and Advice,' was presented to him by the House of Commons, praying him to take a high title and to appoint his successor. That he would have taken the title of King there is no doubt, but for the strong opposition of the army. This induced him to forbear, and to assent only to the other points of the petition. Upon which occasion there was another grand show in Westminster Hall, when the Speaker of the House of Commons formally invested him with a purple robe lined with ermine, and presented him with a splendidly bound Bible, and put a golden sceptre in his hand. The next time the Parliament met, he called a House of Lords of sixty members, as the petition gave him power to do; but as that Parliament did not please him either, and would not proceed to the business of the country, he jumped into a coach one morning, took six Guards with him, and sent them to the right-about. I wish this had been a warning to Parliaments to avoid long speeches, and do more work. It was the month of August, one thousand six hundred and fifty-eight, when Oliver Cromwell's favourite daughter, ELIZABETH CLAYPOLE (who had lately lost her youngest son), lay very ill, and his mind was greatly troubled, because he loved her dearly. Another of his daughters was married to LORD FALCONBERG, another to the grandson of the Earl of Warwick, and he had made his son RICHARD one of the Members of the Upper House. He was very kind and loving to them all, being a good father and a good husband; but he loved this daughter the best of the family, and went down to Hampton Court to see her, and could hardly be induced to stir from her sick room until she died. Although his religion had been of a gloomy kind, his disposition had been always cheerful. He had been fond of music in his home, and had kept open table once a week for all officers of the army not below the rank of captain, and had always preserved in his house a quiet, sensible dignity. He encouraged men of genius and learning, and loved to have them about him. MILTON was one of his great friends. He was good humoured too, with the nobility, whose dresses and manners were very different from his; and to show them what good information he had, he would sometimes jokingly tell them when they were his guests, where they had last drunk the health of the 'King over the water,' and would recommend them to be more private (if they could) another time. But he had lived in busy times, had borne the weight of heavy State affairs, and had often gone in fear of his life. He was ill of the gout and ague; and when the death of his beloved child came upon him in addition, he sank, never to raise his head again. He told his physicians on the twenty-fourth of August that the Lord had assured him that he was not to die in that illness, and that he would certainly get better. This was only his sick fancy, for on the third of September, which was the anniversary of the great battle of Worcester, and the day of the year which he called his fortunate day, he died, in the sixtieth year of his age. He had been delirious, and had lain insensible some hours, but he had been overheard to murmur a very good prayer the day before. The whole country lamented his death. If you want to know the real worth of Oliver Cromwell, and his real services to his country, you can hardly do better than compare England under him, with England under CHARLES THE SECOND. He had appointed his son Richard to succeed him, and after there had been, at Somerset House in the Strand, a lying in state more splendid than sensible--as all such vanities after death are, I think--Richard became Lord Protector. He was an amiable country gentleman, but had none of his father's great genius, and was quite unfit for such a post in such a storm of parties. Richard's Protectorate, which only lasted a year and a half, is a history of quarrels between the officers of the army and the Parliament, and between the officers among themselves; and of a growing discontent among the people, who had far too many long sermons and far too few amusements, and wanted a change. At last, General Monk got the army well into his own hands, and then in pursuance of a secret plan he seems to have entertained from the time of Oliver's death, declared for the King's cause. He did not do this openly; but, in his place in the House of Commons, as one of the members for Devonshire, strongly advocated the proposals of one SIR JOHN GREENVILLE, who came to the House with a letter from Charles, dated from Breda, and with whom he had previously been in secret communication. There had been plots and counterplots, and a recall of the last members of the Long Parliament, and an end of the Long Parliament, and risings of the Royalists that were made too soon; and most men being tired out, and there being no one to head the country now great Oliver was dead, it was readily agreed to welcome Charles Stuart. Some of the wiser and better members said--what was most true--that in the letter from Breda, he gave no real promise to govern well, and that it would be best to make him pledge himself beforehand as to what he should be bound to do for the benefit of the kingdom. Monk said, however, it would be all right when he came, and he could not come too soon. So, everybody found out all in a moment that the country must be prosperous and happy, having another Stuart to condescend to reign over it; and there was a prodigious firing off of guns, lighting of bonfires, ringing of bells, and throwing up of caps. The people drank the King's health by thousands in the open streets, and everybody rejoiced. Down came the Arms of the Commonwealth, up went the Royal Arms instead, and out came the public money. Fifty thousand pounds for the King, ten thousand pounds for his brother the Duke of York, five thousand pounds for his brother the Duke of Gloucester. Prayers for these gracious Stuarts were put up in all the churches; commissioners were sent to Holland (which suddenly found out that Charles was a great man, and that it loved him) to invite the King home; Monk and the Kentish grandees went to Dover, to kneel down before him as he landed. He kissed and embraced Monk, made him ride in the coach with himself and his brothers, came on to London amid wonderful shoutings, and passed through the army at Blackheath on the twenty-ninth of May (his birthday), in the year one thousand six hundred and sixty. Greeted by splendid dinners under tents, by flags and tapestry streaming from all the houses, by delighted crowds in all the streets, by troops of noblemen and gentlemen in rich dresses, by City companies, train-bands, drummers, trumpeters, the great Lord Mayor, and the majestic Aldermen, the King went on to Whitehall. On entering it, he commemorated his Restoration with the joke that it really would seem to have been his own fault that he had not come long ago, since everybody told him that he had always wished for him with all his heart.